Goodhue's concept of the building was as “a central pavilion in a small but heavily wooded park.” Thus landscaping would be a crucial element in the Academy building's overall aesthetic. Well-known New York landscape architect Charles Downing Lay was commissioned to draw up the plans for the grounds in 1924. 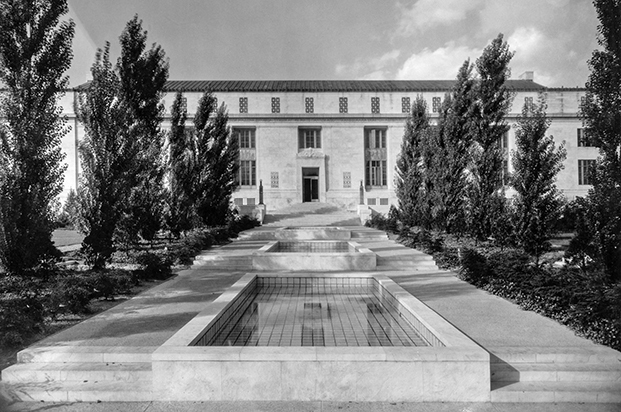 The NAS Building as viewed from Constitution Avenue showing three reflecting pools (now planting beds), circa 1928. NAS Archives. The focal point drawing the eye toward the front entrance was a series of three shallow rectangular pools lined with turquoise-hued tiles and stocked with exotic fish by the U.S. Bureau of Fisheries. The topography of the land, which inclines gradually upward from Constitution Avenue to C Street, had suggested to Goodhue the placement of these pools in stepped areas of the walkway leading to the building's main entrance. The original site plan called for 679 trees of 55 different species and numerous shrubs and ground cover. The initial installation was somewhat difficult as the soil was poor, described in a letter from Lay's office as “composed of loose cinder fill and refuse such as old bottles, etc.” The low quality of the soil, combined with hot summers and insufficient attention to maintenance, soon forced changes to the original landscaping. The cost of keeping the pools in repair eventually proved prohibitive, and in 1951 they were filled in and converted into flower beds. 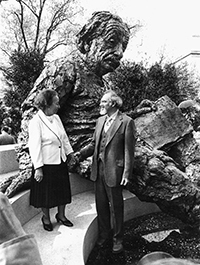 Robert Berks and Elizabeth Roboz Einstein, widow of Einstein’s son Hans Albert, at the Albert Einstein Memorial Statue dedication on April 22, 1979. Photo: Aaron Rosenthal. A memorial to NAS member Albert Einstein was unveiled in the southwest corner of the Academy grounds during the Academy's annual meeting, on April 22, 1979, the centennial of Einstein's birth. Set in a grove of holly and elm, the memorial, which draws thousands of visitors each year, has become, perhaps, the NAS Building's most recognizable symbol. The massive bronze sculpture, measuring twelve feet high and weighing nearly four tons, is supported by three caissons, whose weights total 135 tons, sunk in bedrock to a depth of 23 to 25 feet. The sculptor, Robert Berks based the work on a bust of Einstein he sculpted from life in 1953. Berks created more than 300 portraits of individuals in public and private life, including six U. S. presidents, among them John F. Kennedy, whose bust stands in the nearby Kennedy Center for the Performing Arts. Joy and amazement of the beauty and grandeur of this world of which man can just form a faint notion. At Einstein's feet lies a circular sky map representing the planets, sun, moon, and stars, positioned as observed by astronomers from the U.S. Naval Observatory at noon on the day that the memorial was unveiled and dedicated. The star map is composed of more than 2,700 metal studs set in a 28-foot field of emerald pearl granite from Larvik, Norway. 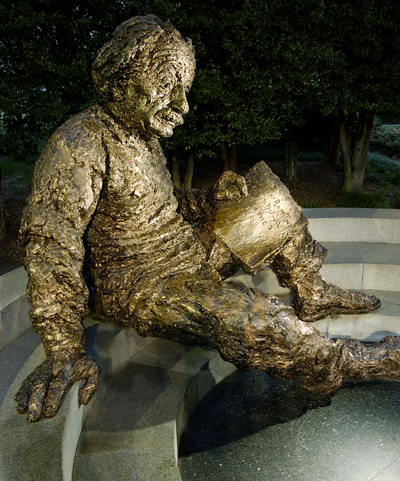 Albert Einstein Memorial Statue © 1978 by Robert Berks. Photo: Alex Jamison. Cultural Programs of the NAS.